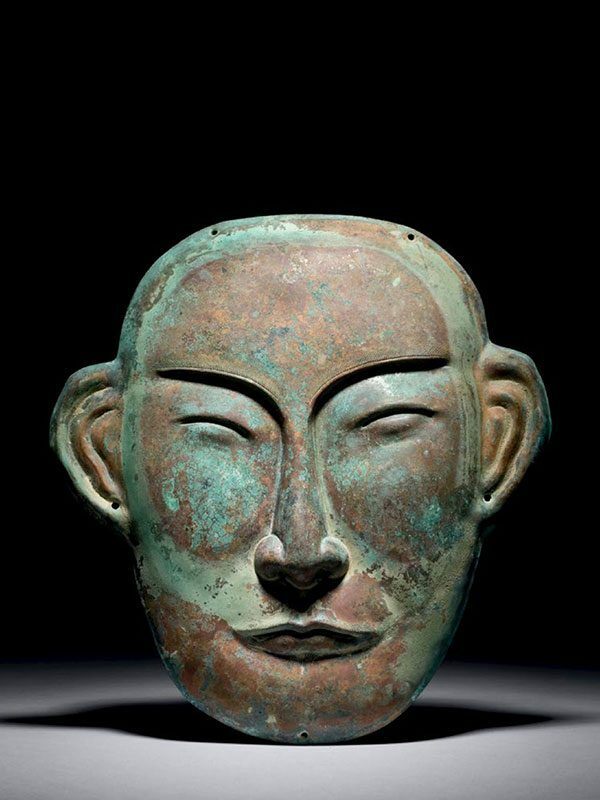 A copper funerary mask representing a human face, worked in the repoussé technique with strong, naturalistically portrayed features and a serene expression. The half-shut eyes are set below pronounced, arched eyebrows that are engraved with finely hatched lines. The face has high cheekbones and a straight, broad nose set above a full-lipped mouth. Two prominent, well defined ears jut out at either side of the head. The earlobes are pierced. The mask is covered in a green patina, leaving relatively large areas showing the original copper finish of the metal. Placing a metal mask on the face of the deceased was a unique, probably originally tribal, burial custom during the Liao dynasty in China. The Liao dynasty was founded by a semi-nomadic tribe of hunters and pastoral people named Qidan (Khitan). The material used for a funerary mask was determined by the hierarchy of the wearer; copper was used for those of lower ranking, although the pronounced features and very well executed detail of the present mask would draw that theory into question. Perhaps the surface of the present mask was originally gilded, allowing it to be used in the burial of a high-ranking individual. A unique gold funerary mask with silver netting still attached, belonging to the Princess of Chen, is now in the Research Institute of Cultural Relics and Archaeology of Inner Mongolia. A comparable gilt-copper mask is in the Meiyintang Collection. Krahl comments that ‘Members of noble families were embalmed and buried with great riches, with gold or gilt-metal masks.’ A further comparable silver-gilt mask is in the Muwen Tang Collection.